Tag Archive | "office document equipment"
Retire in Ecuador, work and live longer! Many who planned to retire… cannot… because of the global economic crash. They have to work. So why not work instead of retire in Ecuador? It may be hard to get a job… a good one especially… in Ecuador or anywhere right now. We can take advantage of this fact and work at something we love by working with our own business. Ecuador is a safe, low stress place. 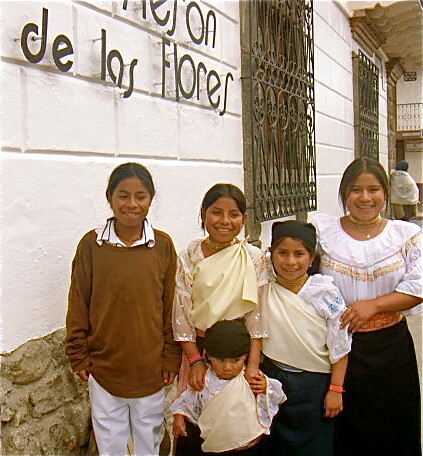 These children work in Otavalo and ride on their own, on tour buses selling scarves, dolls and rugs. The oldest (on the right) is 15. There are several reasons why it’s good not to retire in Ecuador… but to work instead. First retirement, in Ecuador or anywhere, kills! An important part of longevity, for those who retire or not, for those who work in Ecuador or not, is to remain independent, challenged, active and needed. One of the most important features that was found in the valleys of Ecuador where people rarely retire but live long lives, is that old age was revered. In Ecuador old age its not viewed as bad… Maturity is highly respected. People at the age of 100, even 110 are known to still be active and working! There is not the same old age glass ceiling as in the West. If you plan to work beyond retirement age, why not provide your services in a place where you efforts are more appreciated? One does not have to move to Ecuador to work. There are innumerable stories worldwide of how staying at work extends life. One non retirement story that motivated me is of Max Zimmer of Los Angeles. Max came to the US from Austria in 1911 with only a two dollar bill. At age 103 he still had the same two-dollar bill and had built and still ran a multimillion-dollar business. One MD who specializes in anti aging points out that most centenarians seldom spend much time with doctors. When they finally get sick, they die quickly and with little expense. They depend on themselves to remain healthy not others. 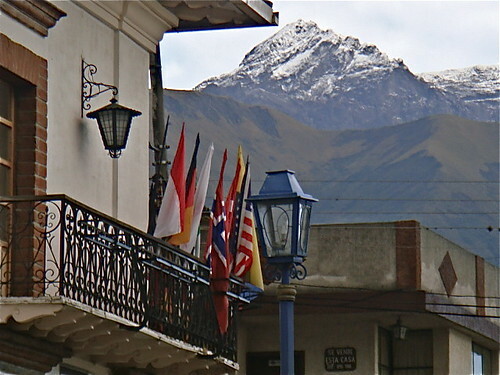 Ecuador is becoming an increasingly international place, offering more opportunity for business work and retirement. Here are the flags of our visitors at our inn, Meson de las Flores. A second extra income from Ecuador retirement work, is that your efforts can be more effective and enjoyable because the cost of living is low. When it is easy to live within your means… huge stress is removed… and make no mistake… stress kills. Third, living in a country, like Ecuador, where slow and steady, is a lifestyle foundation, enhances longevity and makes life more enjoyable as well. Having a good savings and investment plan for old age is an important factor to remaining independent. But the recent economic downturn has destroyed this for many, so why not at least be able to take it easy a bit as you work. Enjoy a more laid back lifestyle. The world has put itself in an economic mess. We do not have to participate if we steadily do something we love in a balanced way. Live where you can afford. Enjoy serving someone every day and spend less than you earn in healthy surroundings where society appreciates your efforts. 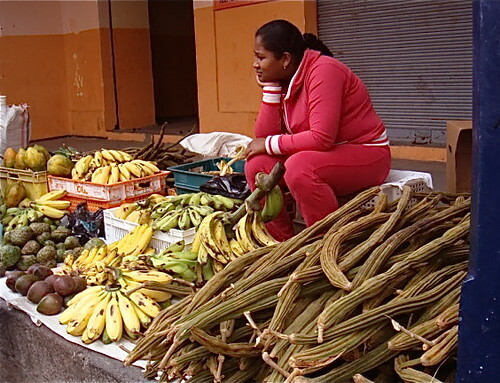 Ecuador has a great supply of fresh, low cost food. Capitalism brought prosperity to mankind. Today’s problems are due to capitalism’s excesses. Seek profits for the good of society and long-term sustainability of companies. Lead with altruism and modesty, seeking reasonable profit over the long term. Q: The 20th century ended with the greatest prosperity in human history. Doesn’t capitalism deserve the credit? A: Capitalism was able to bring previously unknown levels of prosperity to humankind. We have now fallen into an unprecedented recession brought about by capitalism. With humankind’s unlimited desire to earn more profits and live more affluent lifestyles, financial institutions launched new instruments, such as derivatives, using advanced mathematics and statistics. They created enormous profits by leveraging funds that were 10 times larger than their assets. This human desire caused the economic collapse. While the past prosperity resulted directly from the achievements of capitalism, the present difficulties have resulted from capitalism’s excesses. Q: Leverage has not always been bad. Won’t there be times when Kyocera competitors will do far better because they are willing to take a risk with leverage? A: You are right. It’s easy to outperform companies like Kyocera. Companies make huge profits by leveraging their capital. However, if society and employees need a company, then it has to be maintained so it can grow for a long time. This is a company’s mission, to maintain and expand for the long haul. The correct way to manage a company is to have a firm financial foundation that is capable of overcoming economic downturns rather than making a significant profit in the short term. I will continue to aim for stable management even though we are facing harsh economic challenges. Inamori is now 77-years old and is showing no signs of slowing down! I chose to quote him because he is a great example of steady success and shows how continuing to work rather than retire enhances longevity. Inamori was born in Japan and at age 27, he started Kyocera. His company is now a high-tech multinational maker of cellphones, office document equipment, solar power products and ceramic components that employs 66,000. 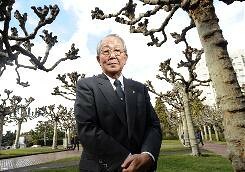 He founded KDDI in 1984, which is now Japan’s second-largest telecom network. Our lives do not have to be dictated by the errors of others. No matter how insane a society becomes, we as individuals can remain steady, balanced and happy by serving others while living within our means. Retirement in Ecuador makes good living less expensive. Yet we can adhere to these principles anywhere to live longer and happier… not tired or retired no matter how old we are. See more on Ecuador retirement at Why Ecuador Retirement and Retire in Ecuador Idea. Join us at our North Carolina farm this July or October for our International business & investing seminars below. Or join us and learn more about living and retiring in Ecuador.